By Light Unseen Media, 9781935303626, 558pp. Today, vampires are ubiquitous in our popular culture. From movies to television, in fiction and in art, and even within the hallowed halls of academia, these preternatural creatures of the night are turning up everywhere. But in the not-so-distant past, vampires evoked more fear than fascination; they lived in the shadows and were the stuff of nightmares. Our concept of them was forever changed with the publication of Bram Stoker's Dracula in 1897. Bela Lugosi, whose iconic portrayal of Stoker's vampire was a hit on both the stage and screen, appeared in 1949 on one of the first televised variety series, The Texaco Star Theater. In the guise of his most famous role, Lugosi brought the vampire into our living rooms, heralding an undead presence on TV that steadily increased before skyrocketing with the arrival of Buffy Summers to Sunnydale, California. The medium of television, in turn, has played a critical role in the evolution of the vampire; these fanged fiends have become as diverse as the population that they prey upon, and every generation creates their own interpretation. For over sixty-five years, the undead have bled the TV airwaves, rising from the crypt in all manner of programming. 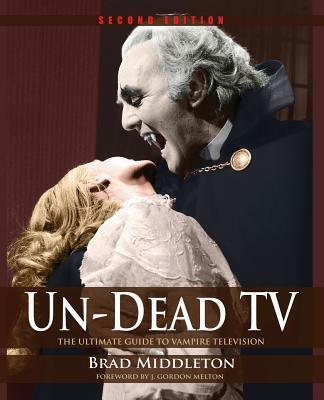 In this expanded and updated second edition, Un-Dead TV catalogues over one thousand such appearances, and is the only book of its kind to explore this phenomenon to the extent that it truly deserves.